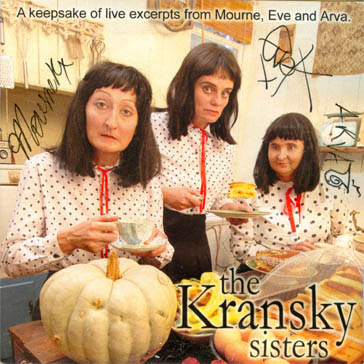 While looking up the Wikipedia page for Talking Heads’ “Psycho Killer,” I saw a link to a page for The Kransky Sisters, an Australian comedy-cover band trio. KrisDina and I saw the Kranskys’ show at the Sydney Opera House, and were much better off in life for having done so. Due to the mysterious disappearance of tuba playing, Arva Kransky, who was last seen exchanging sheet music with a member of the Hornbell Military Marching Band, the Kransky Sisters have enlisted the assistance of their rarely visited, reclusive sister, Dawn Kransky, who has taken leave of her job as trolley librarian at the Esk Hospital to be with her Sisters. Me being the strange obsessive I am, I can’t help but note the strangeness of the fact that Eve and big sister Mourne replaced their now-missing sister with a fourth, never-before-mentioned sister, Dawn Kransky. To me and the rest of the planet’s population who find themselves in the awkward position of having to explain to people why Buffy the Vampire Slayer was a good show, the fact that the blinked-into-existence sister is named “Dawn” is especially notable since the show’s fifth season introduced Buffy’s little sister, Dawn, who previously didn’t exist. (It was eventually explained. The short answer: magic.) And this Dawn was played by Michelle Trachtenberg, which meant that Harriet the Spy got to meet Buffy the Vampire Slayer. Anyway, I thought it was relevant. I’ve done it before and I’ll do it again, dammit.